National Flash-Fiction Day is rolling down the tracks, coming closer and closer. But before it gets here we have a host of deadlines for competitions and anthologies. So, I thought I would give you a list of the dates so you don't miss any of them. Full details of all of these can be found on our website at http://nationalflashfictionday.co.uk/competitions.html. So, sharpen your pens, brush off your keyboards, and get your work in while you still can. Well, as you have a probably noticed, now that Christmas is well and truly over the engines have started turning over again here in Flash-Fiction Day central. Things are starting to move and we're ready to get on the road. We have added a whole new batch of writers to the website and had our first entry on our 'International' Section. A batch of new events has been added and there are more to come. Our micro-fiction competition has come and gone, and results will be announced around the end of the month. And we are waiting to hear back about an Arts Council Bid which will allow us to do some more shiny things. All of this is fantastic, but it is still really just a start. We need to keep going and keep growing and ensure that 16th May is the spring board for annual Flash-Fiction Days in the years to come. So, if you are a writer of flash-fiction (with at least a couple of publications, or a flash-fiction blog or something similar) then get in touch as we'd like to list you on the site. This applies to International writers too - please get in touch. If you are planning an event, even if you aren't sure of all the details yet, let me know so I can at least put something up to make people aware of what's going to be happening in their area. And, if you aren't yet planning an event... why not? If you need inspiration, some of the things happening so far include: flash-readings, flash-slams, competitions to be announced on or near the day, workshops and anthologies. If you're a student or teacher, why not organise something within your Uni or school? If you work at, borrow from, or live near a library, why not get in touch with them and see if they want to do something? If you have a local paper, radio or TV station, why not drop them a line and see what they think. At least one local newspaper will be running a competition, so why not suggest that to yours? (Also, if you are doing something, but it's not open to the public, such as a class being run in a school or uni, please let us know anyway so we can share it as a source of inspiration to others). If you have a blog or website, then please think about promoting the day. I'm available for online (or in person) interviews about it all, if that's any use to you. Conversely, if you would like to write a guest blog entry for us about flash-fiction, why you like it, how you came to it, how you do it, or anything else flash-related, we'd love to hear from you. If you have a webcam, why not film yourself reading a story and put it up to YouTube or similar. In the recent update we have added Nik Perring reading one of his and it looks great. We'd like to build up a YouTube channel if we can. And finally, if you would like to be the co-ordinator for your region, please do get in touch and we'll make it happen. And, of course, if you think of anything that we haven't listed, please let us know, new ideas are happening all the time and it's great to be able to share. This is shaping up to be one heck of a day, but we do need your help to make it happen. Thank you all for your hard work so far, and roll on May 16th! Author Ingrid JendrzejewskiPublished on 16 December 2011 Leave a comment on And… we’re off! Well, it's taken a while since the first inkling of an idea, but preparations for National Flash-Fiction Day are now underway, some of the events have already been organised, writers, readers and publishers are talking and making plans, and the website is now up and running at http://nationalflashfictionday.co.uk/ complete with details of our Micro-Fiction Competition. So, what now I hear you say. Well, Christmas first, I think, and then the planning starts. There are many, many possible ideas for events for Flash-Fiction Day, so time to start thinking about what YOU are going to do. Are you going to write, read, slam, teach, publish, collaborate, run a competition, a combination of some or all, or something completely different. Whatever it is, this is your chance to join with others across the country to celebrate the tiny fiction form that does so much! Visit the website regularly to see what's going on in your area, and soon we will have regional co-ordinators who can lend you a hand, and let's make this first National Flash-Fiction Day a day to remember! Oh, and before I forget, we're looking for guests to write for this blog. We want your posts on all areas of flash-fiction: your definition of a flash, what you like about it, why you started writing it, who your favourite writer is, a review of a book, a plan for an event, even a piece of flash-fiction and an explanation of where the idea came from and how you wrote it. Whatever you fancy writing for us, as long as it's flash-fiction related, we want to know. So, send us an email at nationalflashfictionday AT gmail DOT com with your proposal for a blog post and let's get it filling up with all your wonderful thoughts. 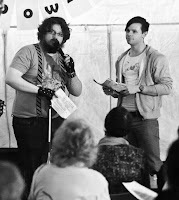 To start us off we will soon be having a post from Dan Holloway of eightcuts who will be talking about the flash-slam he is hosting for National Flash-Fiction Day and explaining just what a slam is anyway! So, Happy Christmas from us, and we'll be back with words from Dan very soon. Published on 16 December 2011 Author Ingrid JendrzejewskiCategories blog, eightcuts, flash-slam, websiteLeave a comment on And… we’re off!